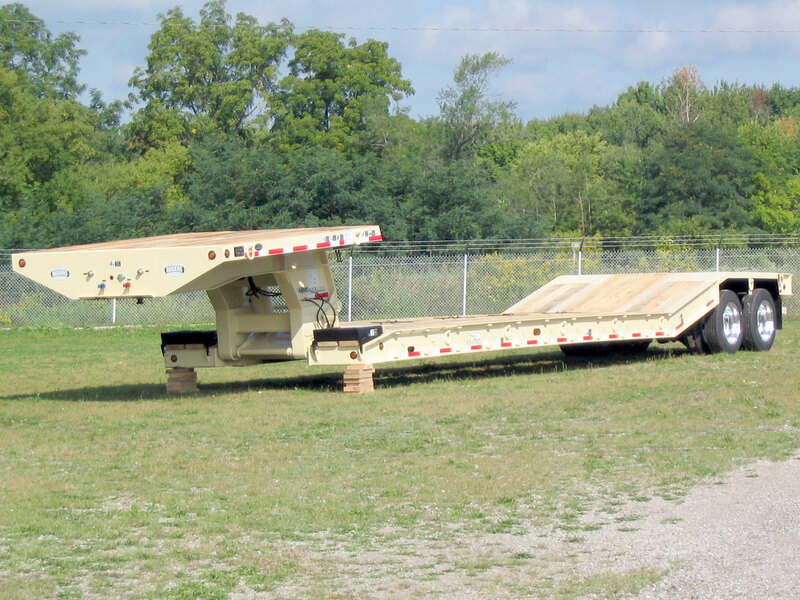 This lowbed is a ROGERS 35-ton "Gentle Riser" featuring a full-width (8'-6"W) platform on top of the "No Foot"® detachable gooseneck. The full-width gooseneck allows space for crates and other items to be carried on top. The cream finish color was a custom specification. The 16° riser section provides easy access to the rear frame deck. The customer specified aluminum wheels that save weight and "dress up" the trailer. The deck is 2" air-dried oak with an optional steel-covered toolbox. The hydraulic controls are located on the outer edge of the gooseneck platform for easier operation. The 24" rear extension is the extra space on the rear deck. Customer specified LED light package. The rear impact guard is welded tot he rear channel below the extension. The square opening on top of the rear deck is for access to the mechanical height control of the air ride suspension.